Philip Glass is one of America’s best-known classical composers, whose work includes film scores for Koyaanisqatsi, The Thin Blue Line, and Kundun; the famous opera trilogy of Einstein on the Beach, Satyagraha, and Akhnaten; and numerous symphonies and popular works. At the same time, Glass’s non-traditional musical syntax, his experimental, minimalist approach, and his ambiguous tonality have long resisted interpretation, and indeed very few analyses of his compositional techniques have been published. In this in-depth study, John Richardson develops new theoretical models through which to analyze both Glass’s work and its genesis. Careful explanations of theory and compositional strategies, close readings of the work itself, considerations of the collaborative aspects of the opera’s evolution, and incorporation of previously unpublished interviews with Glass himself combine to illuminate both a landmark work of contemporary music theater and a dominant figure on the American musical landscape. JOHN RICHARDSON, Ph.D., is a musician, journalist, and musicologist who has taught at Universities in Finland and conducted research at several institutions in North America. He currently teaches at the Department of Music at the City University of London, in UK. 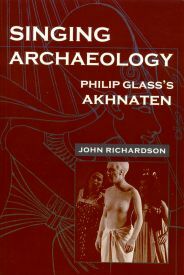 Title: Singing Archaeology: Philip Glass’s Akhnaten. Author: John Richardson. Wesleyan University Press. Published by University Press of New England, Hanover (USA) and London (UK). Copyright 1999 by John Richardson.